Beth and Jason, being unique and adventurous, decided that the perfect place for them to go after they recessed out the aisle was to get into a rowboat for their own champagne toast and some private time together. Now, as the ceremony was to be held on a raised platform over a lake, a rowboat was not a problem. 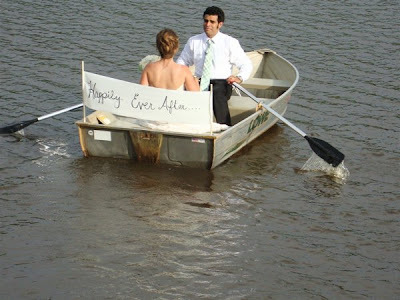 But a wedding dress in a rowboat?! 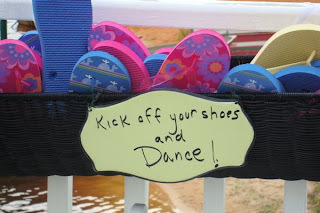 And heels?!! Yikes! But Jason’s eyes were sparkling when he said it so I knew it was going to happen - and happen with style. And that it did, as the guests watched from the railing above. Jason told me that while he did not have individual titles for his Groomsmen, they were in fact the “guys that got my back” and for that reason they were all equally important to him. And I could definitely see this was true at the rehearsal and on the wedding day. Strong friendships all around. On hand to make the music jump and keep the soundtrack for the event going strong was the ever fun and efficient DJ Richie of RJ Entertainment. Richie and I have worked together only a few times, but I can tell you he is a consummate professional. 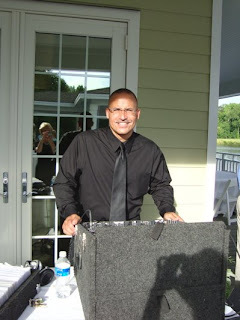 He encourages his clients to choose music that reflects them and their style and Beth and Jason did exactly that. Listening to all the tunes they had chosen I couldn’t believe my ears. Even Bob Dylan?! Yeah! It was an eclectic mix - but then I should have expected that with Beth and Jason. Here’s a photo of DJ Richie, and the shadow in the foreground is me taking his picture. Yes, I know. Pretty klutzy. But luckily they didn’t hire me as their photographer. 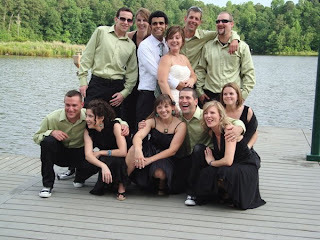 Who they did hire for their photographer, though, was the husband and wife team of Erin and Joshua DeFisher. I had not met them before but they obviously work well together and from the shots I saw them taking, I can’t wait to see the rehearsal and wedding photos! Their company is J & E Photography and I went to look at their website after I got home from the rehearsal. Nice work. Based on what I saw, Beth and Jason are sure to be very pleased with the results and hopefully Erin and Josh will remember to send me some photos to post here. The videographer, Rob Johnson of R E Johnson Productions, was an active man with a clever and practical front harness that kept his camera steady and ready - and he was fun to watch in action. He was so agile he could dart and sprint like a cat to catch the action and the videos he and his assistant, Mary Lou Bell, (who had her camera stationary on a tripod) put together are sure to be lots of fun. Wish I could be a fly on the wall while they are being watched. 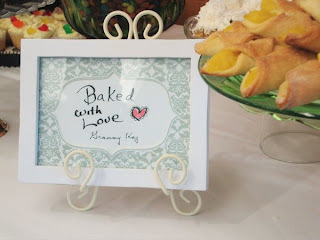 The wedding and reception were held at Bass Lake Retreat in Holly Springs. This is a wonderful location for a wedding as it sits at the edge of - and extends a bit above - the water of Bass Lake. It also has a nice room for a reception, can hold a fairly good sized group inside and out, and as the day retreats and the water gets still, it takes on a serenity that just can’t be beat. Serving up the food for the evening was the catering company, Lip Service, owned by Chef John Gilreath. Beth and the chef are long-time friends and she and her sister often help out when needed, so you can be sure that Chef John was going all out for Beth and Jason‘s wedding feast. Lip Service can be reached by phone at 919-859-8100.
all the sweet goodies. No small feat, that. I had more than one person tell me I hadn’t lived until I had tasted Granny Kay’s this or that item so I’m sure there was nothing left by the time everyone went home. Beth and Jason did so many fun and unique things for their wedding and as I write this post, they are honeymooning in Greece. Sounds like a perfect place for a couple with such a strong zest for life!